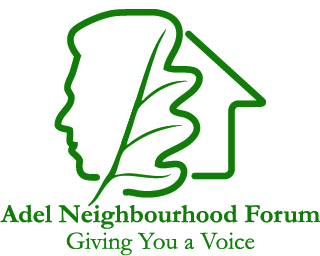 The purpose of the Adel Neighbourhood Forum, which is a recognised body of local volunteers, is to give a renewed sense of ownership to the Adel Community on land development and the issues arising. Set out below is where we are in the planning process to receive full statutory recognition. We have finalised a draft of The Neighbourhood Plan for Adel which has been informed by our “Open Days”, Surveys, Focus Groups, events and publicity. The Plan is for the next 20 years and it covers the design, layout, character and mix of proposed housing but also critical issues arising from such developments such as education provision, traffic, heritage and green issues, community facilities and business support. -the land opposite Adel Parish Church where there are traffic issues and concerns about the proposal to locate a playing field with fencing on the east side of the beck. -the Green Belt land in Dunstarn Lane. -the Tile Lane Site including the old Reformatory Site. The green space, cycle ways and paths issues drew encouraging support as did plans for a children’s play area. The Draft Plan was passed to Leeds City Council for comments. Although generally positive there were some comments from them which need to be addressed. So now The ANF Steering Committee will take account of the comments received and also bring the the Draft Plan up to date. The Plan as revised will then be submitted to an independent Inspector to review it against the legal requirements. Once agreed by the independent inspector it will go to a Referendum where 50% support of those voting would be needed to gain approval. If successful it would give statutory powers for the Forum to be consulted on land development issues. The comments and feedback agreed by the Inspector will be taken into account in the final SAP. There has, to date, been presentations on such as GreenSpace. However, following new consultations with the Department of Communities and Local Government, Leeds City Council requested a suspension of the Inspection to take account of the new information received. The result of this is that the Inspection process of the Leeds’ Site Allocation Plans has been put on hold probably until May 2018.